Kevin Kerr was in the starting lineup when Pittsburgh Riverhounds SC officially opened Highmark Stadium at the start of the 2013 USL Championship season. It was a night that ended in disappointment for the home fans, who saw a late winner by the side that would become Penn FC spoil the party. On Saturday night, as the club celebrated its seventh season opener at the picturesque stadium on the banks of the Monongahela River with a regular-season record crowd of 5,182 fans, Kerr made sure that the Steel Army and all the rest went home happy. It was a typical Kerr moment, too. A piercing low, curling finish from 20 yards that flew into the bottom-right corner of the net with 16 minutes to go. It was followed by the celebration that has marked Kerr’s time at the club as he drew back his invisible bow and fired an arrow into the night sky now echoing with cheers. There have been plenty of those moments over the years. Now the elder statesman on Head Coach Bob Lilley’s squad, Kerr is the lone member of the Hounds still part of the side from that opening night. At 30 years old, there will hopefully be a few more for the man who entered this season 14th on the Championship’s all-time regular-season appearances list. 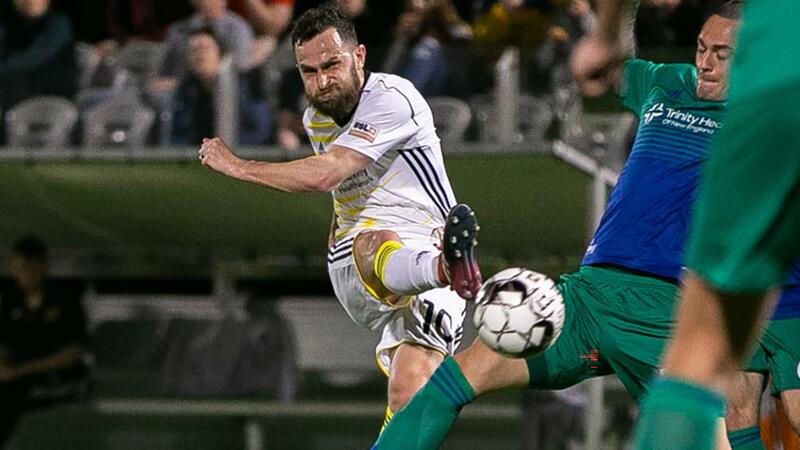 As the Hounds claimed only their second home opener victory at Highmark, the Scottish midfielder painted another perfect moment for a club ready to make its move in the Steel City. 1. Kerr was the only player from the 2013 opening still in the Hounds’ starting lineup on Saturday, but the man who scored the first goal in Highmark Stadium’s history was also there and Jose Angulo marked his return to his former stomping grounds in exceptional style. 2. Angulo earned the Championship’s Most Valuable Player award in 2013 after scoring 15 goals for the Hounds to lead the side to the playoffs. His first goal for the Athletic landed at the No. 2 spot on SportsCenter’s Top 10 on Saturday night, and served as his 48th regular-season goal in the Championship overall. It may not be much comfort to Athletic fans who see their side still rooted to the bottom of the Eastern Conference, but getting Angulo going offensively is going to be key to any turnaround the side might find after it wraps up its eight-game road trip. 3. Whenever a player goes out on loan, there’s nothing better than making a big first impression. For Birmingham Legion FC fans, J.J. Williams accomplished just that in the club’s 3-2 victory that handed Eastern Conference-leader Saint Louis FC its first loss of the season. Raised in Alabama, Williams arrived this week from Columbus Crew SC and notched a pair of high-quality finishes after coming on as a second-half substitute, giving him just the introduction he would have hoped for. 4. In the bigger picture, Birmingham’s win was another sign the side is coming into its own. Back-to-back road wins against Louisville City FC and Saint Louis FC are hard to pull off, and while it might have needed a big stoppage-time save by Matt van Oekel to preserve, moments like that are exactly the reason the club brought in the experienced veteran for its inaugural campaign. 5. I picked the Tampa Bay Rowdies’ John McCarthy to earn the Championship’s Goalkeeper of the Year award in preseason (shameless plug alert) and on Saturday night against Louisville he showed why I think he’s among the top ‘keepers in the league right now. McCarthy’s seven-save display made sure the Rowdies stayed undefeated after a 1-1 draw against Louisville City FC, and you could tell as he walked off the field after the game that Abdou Thiam’s 88th-minute equalizer for the visitors was eating at him. That’s the sort of competitor any team would want in net, and why the Rowdies are back among the prime contenders in the East. 7. It might go without saying, but there might not be a better story in North American soccer right now than New Mexico United and Santi Moar. After nabbing March’s Championship Player of the Month award on Thursday, the Spaniard proceeded to add the first hat trick in New Mexico’s history in a 5-1 romp past Real Monarchs SLC as United’s attack scythed through the Monarchs’ defense in a four-goal first half. 8. Moar is now tied for the league-lead with seven goals, and after just seven games has set an individual single-season high after notching six tallies in each of his two seasons with Bethlehem Steel FC. With Chris Wehan also grabbing a goal and two assists, United is well on track to make my colleague John Arlia’s preseason prediction come true. 9. The team no-one is talking about right now out west might be Fresno FC, but after its 3-1 win against Tulsa Roughnecks FC continued its undefeated start to the season that should probably change. The solid defense is still there – the Foxes conceded only 38 times in 34 regular-season goals a season ago – but now there seems to be enough attack to complement that. Fresno gets a bye next weekend, but that’s followed by consecutive games against Orange County (home), Real Monarchs (away) and the first Highway 99 Derby of the season against Sacramento Republic FC (home). If the Foxes continue to build momentum over the next two games, Chukchansi Park should be rocking for that one. 10. It might have arrived more than a month after club VP of Marketing & Sales Sam Doerr was expecting, but Phoenix Rising FC’s 2-0 win on the road against El Paso Locomotive FC for its first victory of 2019 showed the defending Western Conference champion back at its best. After being gifted an early lead for Junior Flemmings, Rising FC put in a defensive masterclass to stymie the hosts, who were limited to only four key passes and one shot on goal. 11. It’s easy to get taken in by the dazzling attacking talent Phoenix has, but arguably the core identity of this side can be found in its spine, led by the defensive midfield duo of Collin Fernandez and Kevon Lambert. Both just 22 years old, they’re a top tandem in the league when on the field together. The quiet El Paso debut of former U.S. Men’s National Team forward Jerome Kiesewetter was a great example of that. 12. In hockey, they call it a player’s “office”, that place on the ice where a sniper like Alex Ovechkin will make you pay if you leave them space. The New York Red Bulls II’s Tom Barlow might not be as prolific yet as the Great 8, but he’s found an office of his own the past couple of weekends that should have opposing defenses paying attention. Mother Nature ensured the opening goal against Birmingham Legion FC didn’t count in his tally of five goals this season, but Barlow’s brace on Saturday night in the Red Bulls II’s 2-1 road victory against the Charlotte Independence showed the second-year pro is adding to his repertoire. While many of Barlow’s goals last season saw him making hard runs to the top of the six-yard area to finish, now he’s giving defenders a different look they’ll need to account for, much to New York’s benefit. 13. Two notable firsts on Saturday night, with Bethlehem Steel FC taking its first victory in club history against the Charleston Battery and Reno 1868 FC bagging its first win against Colorado Springs Switchbacks FC in frigid conditions at Weidner Field. Honestly, it’s a major credit to the Switchbacks’ ground crew that they managed to play at all – check out the snow-machine that produced the large snowbanks on the sideline in action here – and to the fans that braved the elements to be on hand. For 1868 FC, though, this a big win as the side rebounded well from its loss in Utah a week before and snapped a three-game winless streak overall. 14. One glance at the box score for Steel FC’s 3-1 victory shows the Battery ended up outshooting its hosts 19-13, but that was more due to a solid defensive effort late on by the hosts than anything as the Battery took the last 10 shots in the game. What was most eye-opening, though, was the ease with which Kacper Przybylko notched his second goal of the game to restore Steel FC’s two-goal lead. You’d expect a young side to have a let-down in concentration directly after scoring – as Bethlehem had to let the Battery back within a goal a minute earlier – but for Charleston to get caught with so many people upfield that Przybylko was simply waiting just inside his own half for a breakaway chance to happen, avoiding any possible offside call in the process, was incredibly uncharacteristic for Head Coach Mike Anhaeuser’s side. 15. It’s never a good sign for a side when it makes two tactical substitutions at the halftime break. For both Memphis 901 FC and the LA Galaxy II, it was a reflection of poor first-half performances that led to road defeats on Saturday night. In the first Tennessee Derby, Memphis was largely overrun by Nashville SC at First Tennessee Park as the hosts took a 12-1 advantage in shots to the halftime break. Although it took until late on for goals by Matt LaGrassa and Ropapa Mensah to drive home Nashville’s superiority, there wasn’t much question as to which side deserved to take victory in the end. 16. For Los Dos, after two great attacking performances, everything fell flat in a 2-0 loss to San Antonio FC that saw the hosts continued to build some positive momentum. With Bradford Jamieson IV scoring his second goal in as many games – and bringing out a big celebration against the organization he’s currently on loan from – it feels as though things might be fitting into place for Head Coach Darren Powell after a shaky start. Next Saturday’s visit to Real Monarchs SLC will give us more clues as to whether that’s the case. 17. We’ve been waiting for some of the attacking fireworks we saw in preseason from Las Vegas Lights FC to arrive in the regular season. On Saturday night the club produced in fine style as Irvin Parra hammered home a hat trick and Preston Tabort Etaka added a brace in a 5-0 win against Tacoma Defiance that the visitors will not enjoy rewatching. Lights FC hadn’t notched more than one goal in a game prior to Saturday night this regular season, but this might be just the result to get it out of the starting blocks and start producing in front of goal consistently. 18. With just over five weeks to go until the FIFA U-20 World Cup, players on the radar for Head Coach Tab Ramos are going to be trying to make their final arguments for inclusion in the 21-man squad. With that, we give you Andrew Carleton’s assist for ATL UTD 2 on Saturday night in the club’s 2-1 victory against North Carolina FC. That was just one of the things to like about Carleton’s display, which helped his side take its second consecutive victory and end NCFC’s undefeated start to the season. That should bode well for his chances of being on the plane to Poland next month.